This Page Is For Returning Vendors Only! 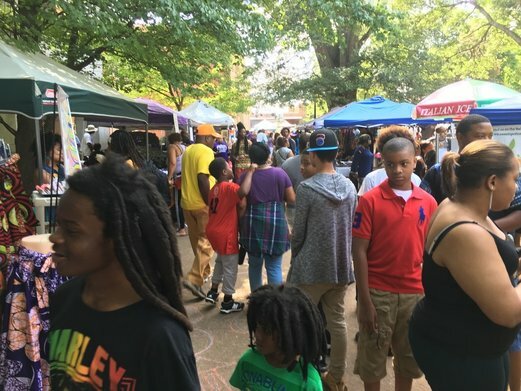 Juneteenth Atlanta has a new venue and rates have increased. As a returning vendor you are given preferred rates for 2019. Please take advantage of these special vendor appreciation rates before April 19, 2019 Good Friday. DOUBLE RED ALERT! Time to Promote! 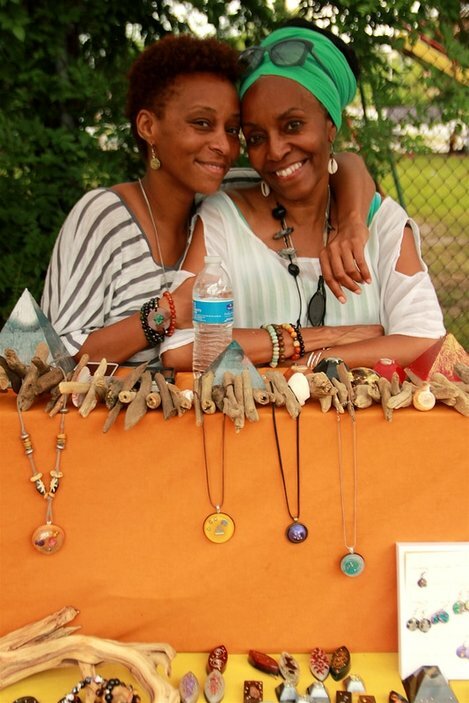 Share in building your own success along with Juneteenth Atlanta. Do you have a Facebook account? Let's make it work! 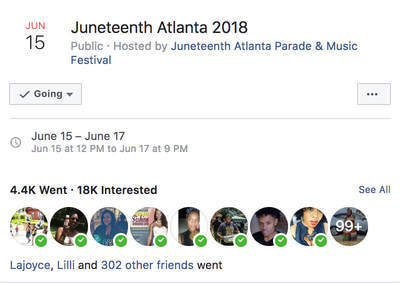 Immediately join our face book event page follow this link "Juneteenth Atlanta 2019" and click on the "GOING" button and then start promoting that you/your business will be at Juneteenth Atlanta 2019. 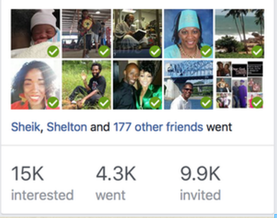 Click on Share - Invite Friends - Select All - Invite. Invite all your friends at one time by using a computer. If you do not use a computer and do not have the facebook app on your cell phone, you will not be able to use "select all" when inviting friends. Save time by waiting until you can use a computer to invite friends! Once you have invited all your friends post the pictures of what you'll be bringing to the festival on the event page. Also copy any flyers that you see on Facebook and share them in your social media. 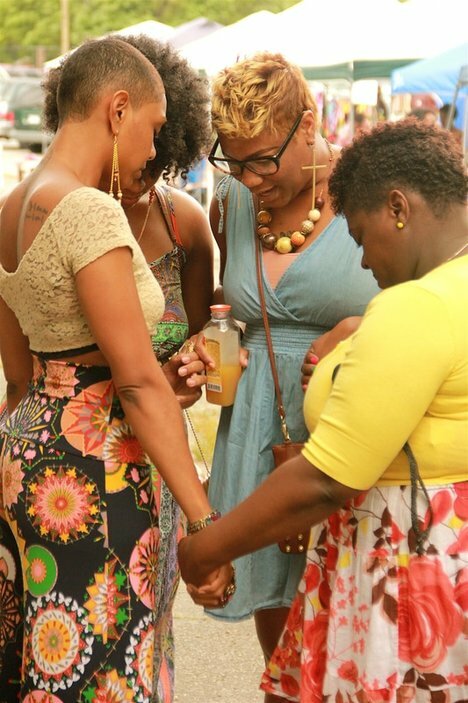 Mention Juneteenth Atlanta in your posts. Use the hashtag #Juneteenthatlanta. Pass this information on to everyone in your group/team and have them do the same! All of us working together ensures a greater turnout and success for you. Last year (2017), we successful invited 10,000, recorded 15,000 interested and ended up with 4,300 that attended. 2018 we recorded 18,000 interested and ended up with 4,400 that attended. Along with your help, we plan to shatter these records in 2019! however, It can only happen through your participation in this promotion. We consider our vendors our partners! We are now accepting vendor applications. Vendor spaces have sold out for the last four years. To assure your space sign up now. ​Be sure that you can vend before registering. We do not offer refunds! Booth spaces for food vendors are10 Ft X 20 Ft all other spaces are 10X10 and will be reserved only for those vendors that have pre-registered. No onsite registration! No exceptions. For customized booth spaces contact management. Food and beverage vendors require a $150 cleaning deposit plus the registration fee of $15.00. Once you have moved out and cleaned/cleared your space as you found it your $150.00 cleaning deposit will be refunded. Fee of 15.00 is not refundable. Vendors that do not clean their spaces forfeit their deposit. We will provide overnight security once you are set up! Read all registration information before making your payment. Payment must accompany your registration form. A payment minus a registration form is incomplete. Be sure to add your Paypal receipt number on the form. No refunds! Make sure you are able to vend before making payment. In case you cannot attend after registering, and you contact us before the event date, your fees can be applied to the following year. ​​IMPORTANT: Double click on the payment amount to see payment options. Vending dates are June 14-16, 2019. One fee for the entire weekend. All sales are final. This is a no refund agreement. We don't do day by day fee options or one day options. We do not do refunds. Please be sure that you are able to vend before reserving your space. You must set up and break down only on the dates stated. No exceptions! By filling out the Juneteenth Atlanta Vendor Form and making your payment you agree to all the terms listed here. ​To register make your payment first by clicking on the appropriate button. Complete the registration form and click Send Form Now. Do not forget to include your PayPal receipt number on the vendor sign up form. Forms without the PP receipt number will not be accepted. ​All payments include a PayPal service fee. No Refunds! VENDOR NOTE: All payments are subject to a service fee that is charged by Pal Pal. If you'd like to avoid the fee use the email listed below and we'll make arrangements to collect your payment in person. Your payment reserves your space: No Refunds!